Our carpet cleaning service begins with a consultation from our 5 Star Technician. He will determine the best methods and proper care for your floor and be able to answer every question you have concerning our process and the expected results. Our technician will then vacuum the carpet in order to remove surface-level dirt and dust. We vacuum along baseboards and beneath furniture too. The Natural® contains a mixture of water and carbonation that doesn’t include soap or detergents. The mixture uses “the power of carbonation” to lift deep dirt from the carpet fibers and bring it to the surface. The Natural® is green-certified and found on the FDA GRAS list. It is 100% safe for you, your family and your home. Our HCE carpet cleaning process features suction and heated extraction to purge dirt and contaminants from your floor as well as remaining traces of The Natural® solution. 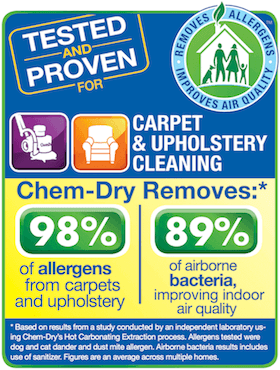 HCE has been proven to remove over 98% of allergens from carpet and owns several industry recommendations. All of the dirt and allergens are extracted from HCE into our hoses and retained in our disposal tanks outside of your home. Neither The Natural nor HCE require much moisture. In fact, we use 80% less water than steam cleaning services and other carpet cleaning companies. The end result is carpet that dries fast. Lastly, we rake the carpet so that the fibers stand up and dry much faster. The end result is beautiful and healthier floors for your home. Chem-Dry of Fort Wayne guarantees satisfaction for our customers in Allen County, IN. If you don’t love our carpet cleaning service or the results, please call us at (260) 409-1138 and we will do our best to ensure you are 100% satisfied. Every carpet cleaning solution and process we use for our professional stain removal service has been tested through Chem-Dry innovation and experimentation. Chem-Dry of Fort Wayne offers flexible scheduling, expertise and healthier solutions as part of our commercial carpet cleaning for businesses in Allen County, IN. Our commercial carpet cleaning uses very minimal moisture so that your business’ carpet is dry before your employees or customers arrive. Expert upholstery cleaning to remove unwanted dust, dirt and stains from your furniture and fabric. Our technicians perform proven solutions and techniques for safe and successful rug restoration. P.U.R.T.® (pet urine removal treatment) from Chem-Dry removes harmful urine odors in 24-36 hours. Fill out our FREE ESTIMATE form for pricing information for our carpet cleaning and other services. “Like” us on Facebook: Read our daily posts for recipes, DIY projects, pet care, cleaning tips and local events! Tell us all about your professional carpet cleaning service from us. We love to hear from customers! Review us here.